This wiki page is all about 3D Touch, including what is 3D Touch, how does it work, how to use it to active Live Photos and more. AnyTrans – A Comprehensive iPhone Manager on iDevices Data management. Download AnyTrans and you can freely enjoy media contents on your iPhone, iPad and iPod anywhere before viewing this guide. 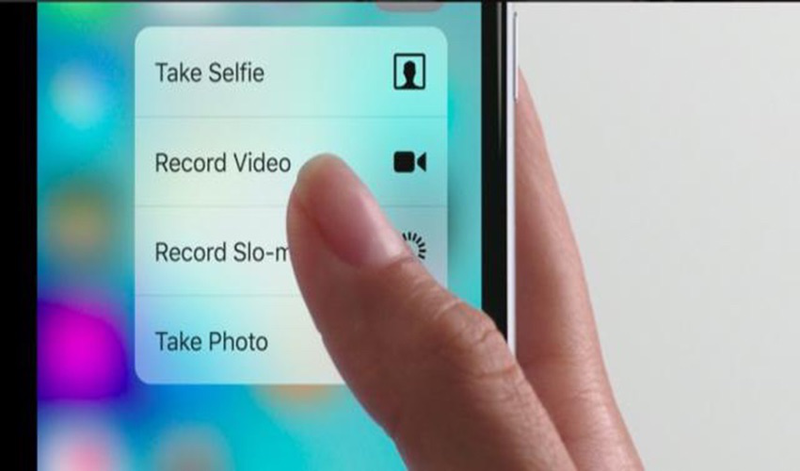 3D Touch is a hardware-based feature that Apple introduced in iPhone 6s and iPhone 6s Plus running iOS 9. With it, users can press deeply to launch actions instead of apps, reply to notifications, preview messages (Learn: how to retrieve deleted messages on iPhone) and links, switch keyboards, switch apps, animate Live Photos, vary stroke width, and more. It also enables users move faster than ever, just like a wormhole through iOS. With Apple 3D Touch, users can take actions without navigating away from the original screen they were on. Swiping or pushing on the screen with more pressure allows users to preview email or other content, access specific application functions from the home screen and more. Peek and Pod are the two main features of Apple 3D Touch. While the former refers to a light press, the later is a hard press. If you want to peek at a message (Learn: how to transfer text Messages from iPhone to iPhone directly), you just need to press it lightly. And, if you wish to pop into the message for a full view, you need to press it a little more deeply. These quick actions with 3D Touch allow users to access specific app functions from the home screen instead of actually launching the app. With an iPhone 6s or 6s plus devices at hand, lots of users may already started taking Live Photos (Learn: how to import photos from iPhone to PC), but did you know that you can play them back at any time using 3D Touch? It is very simple, and you just select the specific Live Photo you want to view and press on it. This even works with Live Photos on your Lock Screen. If Apple 3D Touch works slowly or not sensitively, users can adjust the sensitivity to trigger actions with a lighter or harder press. 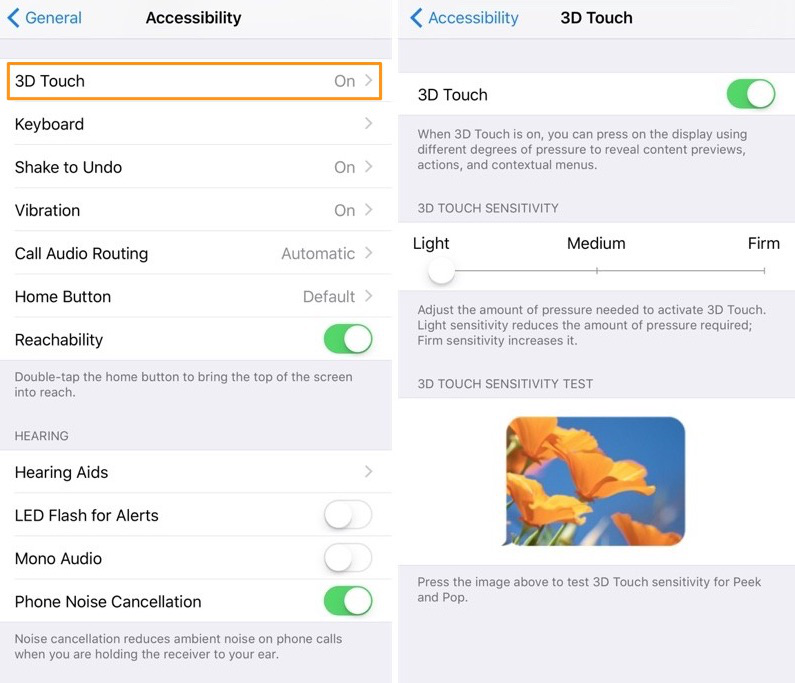 To adjust the pressure settings for 3D Touch, Open Settings on iPhone > Tap on General > Select Accessibility, and then 3D Touch from the available options > Slide the bar to the left or right to adjust the sensitivity. With 3D Touch, users can also access a shortcut menu in Quick Actions to call, text, or FaceTime with certain contacts (Learn: how to transfer contacts from iPhone to iPhone). Apple allows you to change the contacts listed in the 3D Touch Quick Action menu just by rearranging your list of Favorites in your Contacts app.